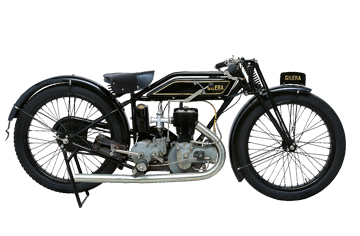 This was the first motorcycle built in 1909by Giuseppe Gilera; it marked the birth of the Gilera legend. The first single-cylinder machines built by Giuseppe Gilera borrowed their general structure directly from the bicycle. The frame was that of a velocipede, reinforced with larger diameter pipes and tyres that had a particularly large section for those years. The motorcycle did not have a clutch or a gearbox, and it was equipped with direct transmission from the crankshaft to the rear wheel by a leather belt. The VT 317 had starter pedals and a decidedly modern engine: two long-stroke overhead valves driven by rocker arms, with large fins on the cylinder and head. The small size and light weight of the VT 317 made it a brilliant motorcycle which could exceed 100 km/h. The Super Sport 350 cc derives from the Turismo 500cc. It differs from the Turismo for the number of fixing bolts on the cylinder head (three instead of four). 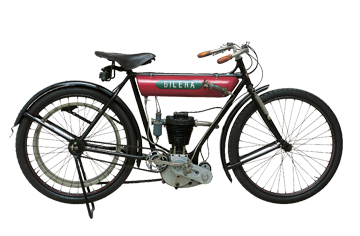 Gilera started producing sports motorcycles in the 1920s, with touring type models that would become bestsellers in their category. The low-slung seat and handlebars and the wide vertical finning on the cylinder head made the Super Sport 350 a true sports bike, faster than the contemporary 500 Sport. The toolbox on the rigid rear fork was very useful for the speed contests of the time, in which the 350 VL version raced in 1926. 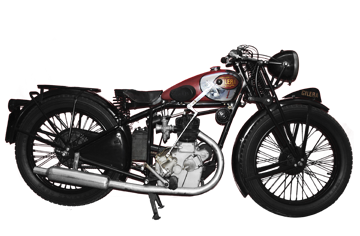 Gilera achieved its first major international victory at the 1930 Six Day race in Grenoble, making its mark in the regularity, cross and speed races with Miro Maffeis and Rosolino Grana on two 500 VL bikes, and Luigi Gilera and Gino Zanchetta on the 500 VL sidecar. The next year at Merano the 500 VL replicated its victory and Gilera decided to put it into standard production until 1934, equipped with new accessories such as the rpm counter, speedometer and a larger-capacity battery. The “Sei Giorni” version of the 500cc, with side valves, differs from the model built in the 1920s for its intake valve (which was not parallel to the exhaust), the angled intake pipe and the hermetic protective caps on the valve shafts at an angle to the axle. Besides, it was equipped with the first elastic rear suspension on a Gilera. The Bitubo, marked by an exhaust system with a single valve and two divergent tubes, was the second stage of a project whose aim was standard production of an engine with intake valves and high performance, but meant specifically for road use. Overall the vehicle was almost identical to the Tre Valvole (three valves), with some variations on the engine (only two inclined valves on the head; rocker arms, tappets and return springs within a wet sump in an aluminium box on the head), and maintained the flat, fish-tail exhaust. The Gilera 220 Sirio was the next step up from the 175 cc, Gilera’s first “utilitarian” model produced in 1931 with the fiscal advantages the government offered to encourage mass motorisation. 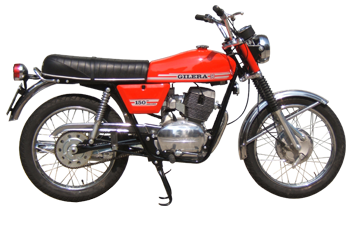 When the 175cc displacement stopped benefiting from these advantages, Gilera decided to produce the 220, which remained on the product catalogue until 1941. 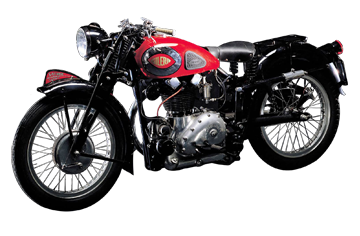 The 220 was modified from the 175cc, with changes in valve diameter and clutch size. It also made abundant use of roller bearings. Contrary to normal practice on higher displacement engines, the removable cover for valve adjustment was placed on the camshaft rather than the finning. 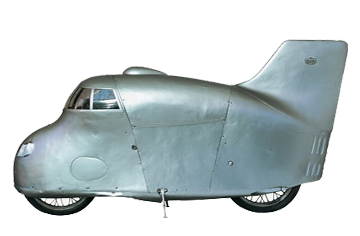 One of Gilera’s objectives was to win the speed record. To this end, at least one of the six Rondine bikes created at the C.N.A. was used. The bike, developed with the Caproni wind tunnel, was entirely faired, with a large stabilising rear fin and a made-to-measure frame. The bike also had a supercharged engine, a longer frame and modified wheels, while the pistons were adapted for fuelling by alcohol. The first objective was winning the medium-distance record, with the short distance and flying kilometre records being aimed at further on. Thus it was the selfsame Taruffi who rode the bike on the Bergamo-Brescia lap on the 29th April. All the previous records were broken by a good 10 km/hour. The 2nd October of the same year, on the same road stretch, Taruffi also won the 5 km, 5 mile, 10 km and 10 mile records held by Henne (BMW) and Handley (F.N. ), with an average of 274.933 km/h over 5 km. The win was valid for the 750 and 1000 classes as well. The 13th of that same month the flying mile record held by Henne (BMW) and Handley (F.N. ), with an average of 274.933 km/h over 5 km. The win was valid for the 750 and 1000 classes as well. The 13th of that same month the flying mile record was also won (at a speed of 272.064 km/h, with a passage of an average 272.324 km/h), as well as the start from standstill record. Which in fact arrived on the 21st October 1937, between the 80th and 82nd kilometres of the Bergamo-Brescia lap. Piero Taruffi reached an average of 274.181 km/h: the absolute record was broken, with a single regret: at just 45 thousands of a second over the speed of Fernihough (Brough Superior), the record was valid for the 500 and the 750 classes, but not the 1000. In 1939, Taruffi bettered his medium-distance record, going over 205 km/h on the hour victory. 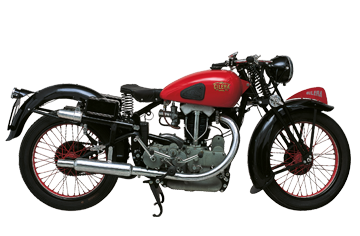 In 1936 Gilera acquired a project for a racing bike from the C.N.A., together with six ready units. Giuseppe Gilera wanted in fact to renew the company’s Grand Prix participation, and the bike created by the C.N.A. had all the prerequisites for being a success on the track. The Rondine (swallow), a supercharged 500 four cylinder with a car-derived engine, had the final touches put on it at the Arcore factory’s racing division by Piero Taruffi, who had supervised the project at the Rome-based company where it was born, and by Piero Remor. The original steel frame was abandoned for a structure in tubes, with a Gilera type rear suspension, and the engine was emproved in its crankshafts. The “Gilera cure” already began to show results in September 1937 on the important Monza circuit, with Aldrighetti coming first after an incredible race. 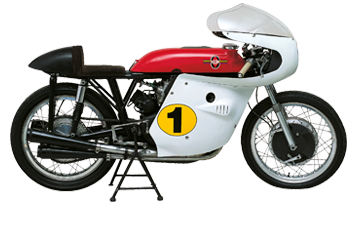 The next year Gilera repeated its victory, easily winning the Italian championship, once again with Giordano Aldrighetti riding. In 1939, with the model displayed here, which had been improved upon, the hoped-for European win arrived with Dorino Serafini. The Rondine that was European champion in 1939 featured a half-moon shaped fairing on the rear mudguard for the first time, used as an oil vapour recovery chamber. The Rondine’s victorious career was interrupted in 1940 with the start of World War II. After a number of primarily experimental models built in 1933 and 1934, the overhead valve engine, identified by the initials VT, finally entered standard production in 1935. The first engine was usually known as the “quattro bulloni” (four bolts) and subsequently the “otto bulloni” (eight bolts) from the number of studs that anchored the base of the cylinder to the engine casing. The single cylinder models in the VT series represented a moment of great success for Gilera, before the launch of the Saturno in 1940. The Marte 500, designed by the engineer Salmaggi for military use, was Gilera‚s last 500 cc side valve motorcycle. 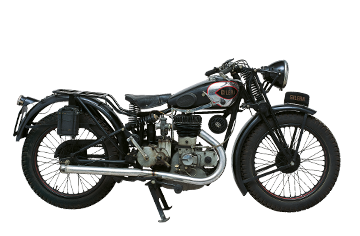 Its engine combined the long stroke single cylinder with a crankcase that included a four speed change. The chief feature of this model was secondary transmission by drive shaft. It also had a shock absorber-equipped rear suspension. Tested by the Wehrmacht High Command, which pointed out its defects (low power, too heavy), it was nevertheless built in 1942 with a civilian version put on the market at the end of the war. This used spare parts remaining in the warehouse (222 units of the civilian version in 1946, 158 of the military model transformed into a civilian version by Gilera). This is one of the world’s best known motorcycles. It was designed by Giuseppe Salmaggi in 1940, and a total of 6,000 were built in several different versions, until 1958. As the model evolved over the years, attention was focused more on the cycle elements than on the engineering, which remained faithful to the original design: vertical cylinder, rocker arm timing gear, bore x stroke 84 x 90 mm. With its unmistakable styling, it is one of the most popular motorcycles with enthusiasts all over the world. The Sanremo series derived from the Saturno Competizione and owes its name to its first-appearance victory on the Ligurian circuit in the spring of 1947. The 1950 version won the most victories of the Saturno series; for five consecutive years it won at Ospedaletti, and was also winner of the Nations Grand Prix at Milan. The Sanremo had a fuel tank with hollows for the rider’s knees and a partial half-moon shaped fairing on the rear mudguard. The front brake was central, with two small holes for the cooling. The steel front fork was diamond-shaped, while the half-moon rear mudguard partially covered the driving wheel. This model, with engine power output of 35-36 bhp, reached a speed of 180 km/h. The first official cross-country Saturno version appeared in 1952 and was powered by the latest racing engine with light alloy head and cylinder, large sump, 35 mm carburettor fitted with air filter, and suspension and brakes upgraded for this specific use. The motorcycle won four consecutive Italian titles, in 1953-55 with Domenico Fenocchio, and in 1956 with Vincenzo Soletti, while in the international field, it also won three French titles, in 1954-55 with Charles Molinari and in 1956 with Remy Julienne. Commonly known as “telescopic” or “feather” (a name that might have been inspired by its being lighter than the Saturno Sanremo), this model was launched in 1952 and put on the market the year after. It featured an engine with light alloy finning on the cylinder head, a bigger crankcase, a telescopic fork in front and hydraulic shock absorbers at the rear. From 1952 to 1957 it notched up several wins in the Formula Sport (the 1955 Milan-Taranto), Grand Prix and Formula 2 (1957) races. In 1957 a fairing-equipped 500 Saturno Piuma triumphed in the F.M.I. Trophy with Cantoni and reached a speed of over 200 km/h at the Nations Grand Prix. 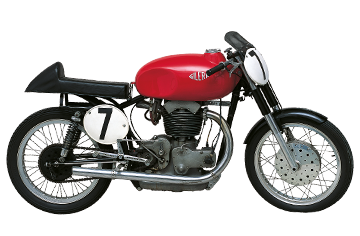 After Gilera’s withdrawal from racing some riders, among them Liberati, Milani and Campanelli, privately made up special versions of the bike, which remained in competition until the 1960s. Competition Gilera Sidecar 500 Four Cylinder was constructed as a unique piece and has been restored by brothers Luigi and Piero Frigerio with a particular carefulness and accuracy. 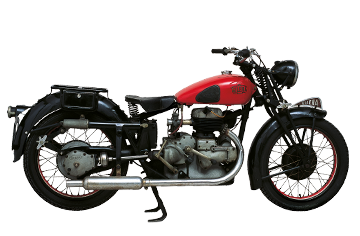 this motorcycle is distinguished from the others by its two-year consecutive victories in 1956 and 1957of the Grand Prix of Nations in Monza. its technical characteristics make it an exceptional model with reduced double cradle chassis (superior and inferior) and shortened “Gilera” type telescopic fork. tha saddle is lengthened to facilitate the passenger’s acrobatic evolutions during international races. on this model, pilot Albino Milani and his brother Rossano reached 190 km/h, breaking 160 km/h in the Monza circuit. 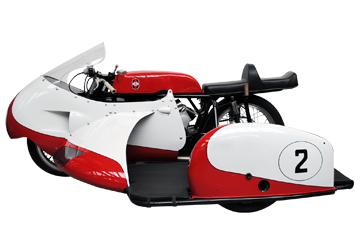 The 1957 season, which is well known both for Gilera Sidecar’s triumphal success and for Gilera, Moto Guzzi and Mondial’s decision to retire from racing, closes a 40-year epoch of Arcore’s motorcycle factory official presence throughout the world’s circuits. 1956 was the year of the 175 cc engine. This had been a classic size before the war and enjoyed a revival as a result of racing activities. In addition to the classic versions, the Normale, Sport and Super Sport, a special Regolarità version was also produced. 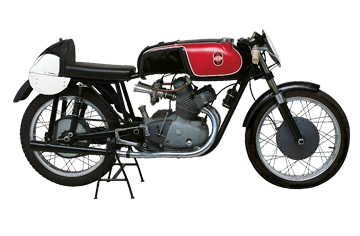 The Gilera 175 Regolarità was entrusted to the official riders in 1956 and a small number were put on the market the following year; it was one of the first Gileras to be built specifically for this speciality. It featured an air filter on the carburettor, suspension with stroke covered by expanding rubber elements, raised mudguards and exhaust pipe, and the mechanical organs a considerable height from the ground. 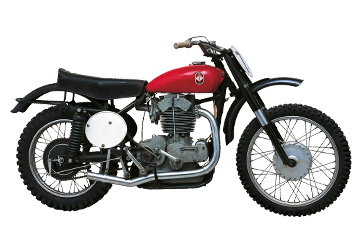 The twin-cylinder Gilera 125 Bicilindrica made its successful debut in 1956 at Monza, driven by Romolo Ferri, beating the favourite, the MV Agusta of Ubbiali. 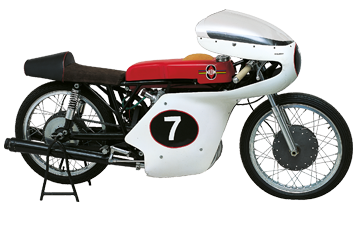 Designed by Franco Passoni, it scored numerous successes in its first year, but the following year only competed in two races in the Italian championship before Gilera withdrew from racing. The model featured numerous advanced technical solutions such as the frame with double upper and lower cradle, a boxed tank designed specifically to be fitted with fairing, two large light alloy brakes with double cam and double control lever. 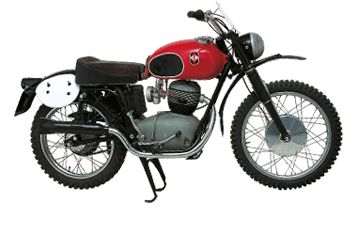 Destined for races such as the Italian Motorcycling Rally and the Juniors (Formula 2) championship, the 175 Bicilindrica (twin cylinder) was produced in 1957 to the specific standards of this kind of race (no fairing, and a precise carburettor diameter limit). At the world championship the motorcycle, equipped with fairing, passed 132 km/h from a standing start and over 208 km/h on the 100-km stretch and the hour. The mechanicals, designed by Franco Passoni, were very similar to those on the 125 Grand Prix version, and used the same telescopic fork, rear shock absorbers and brakes. The gearbox had a five-speed change. The frame had a single upper beam and an aerodynamic “tail” could house a toolkit and documents when the bike raced. 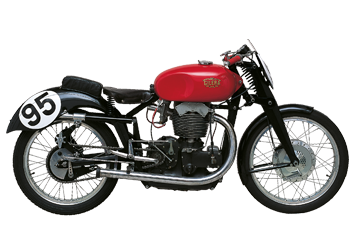 Designed by Piero Remor in 1947, the Gilera Quattro Cilindri 500 was manufactured with various modifications until 1966. 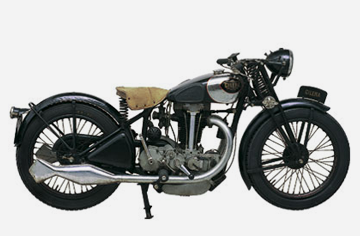 It was certainly one of the best known and most successful racing motorcycles of all time. Between 1948 and 1957 it won 6 world titles: in 1950 and 1952 with Umberto Masetti, in 1953, 1954 and 1955 with Geoffrey Duke and in 1957 with Libero Liberati; it also won the Italian championship 6 years in a row, the Grand Prix of Nations 7 times and numerous Grand Prix titles. 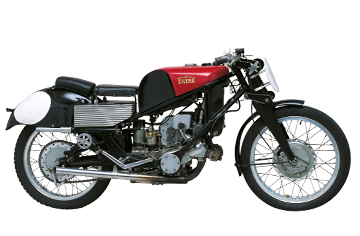 In 1957 Gilera withdrew from racing, thus interrupting the irresistible progress of the Quattro Cilindri, which did, however, return to the race track from 1963 to 1966. The 1963 version had semi-integral fairing, which gave improved handling and greater stability when cornering, producing a top speed of 250 km/h. The 125 and 150 versions of the 5V Arcore, presented at the Milan Fair in 1971, replaced the previous single-cylinder, four-stroke, five-speed gearbox versions with the same displacement that had been a point of strength of production in the late 60’s. It was not, however, a mere facelift but a true revamping: the engines were highly “undersquare”, the fins had a square shape and the crankcase had a new design. The general approach was the classic Gilera style, including the last use of a gearbox with foot pedal to the right of the crankcase and overhead valves with double parallel cylindrical springs. The lower continuous double cradle frame, with reinforcement triangles in the most stressed points, had been considerably modernised.